In the beginning of her career, Kareena Kapoor is known for her chubby figure, but later she stunned her fans with size-zero figure in the movie Tashan. But, have you ever wondered how did Kareena Kapoor lose weight? Well, in this fitness post, let us find out the real diet and workout techniques followed by Kareena to lose so much weight in less time without affecting her facial beauty. How Did Kareena Achieved the Size-Zero Body? Well, it is under the supervision of Rujuta Diwekar, a renowned nutritionist, Kareena has committed to transform her chubby body into a size-zero figure. For that, she has sacrificed her favorite dishes like parathas, pasta, foods with butter, cheese etc… and included healthy alternatives like soups, salads, yogurt and other foods that are rich in vitamins and minerals. Well, if you’re unsure about what size zero is, then below are the body measurements one should achieve to be called a size-zero figure. Kareena Kapoor has achieved this magic figure with healthy diet, strict workouts and regular Yoga exercises for weight loss. Above all the methods to lose weight, it is the diet that helps anyone to reach their goal successfully. A common saying in the health world is that in order to lose pounds, one should aim for 80% diet and 20% exercise. So, first eat healthy and then concentrate on exercise. Without a proper diet, you’ll never lose weight successfully. Kareena starts her day with either a glass of skimmed milk or fruit juice and she totally emphasizes on having vegetarian foods. Lunch: 2 Chapattis with 1 bowl of Dal and 1 bowl of Green salads or vegetable soup. Along with the diet, she also makes sure to drink at least 6-8 glasses or 2-3 liters of warm water everyday. See: How much water should you drink to lose weight? She completely avoids rice, which is nothing but carbs. Find the list of high calorie Indian foods and stay away from them. Stays away from sugar and ghee most of the time. In some rare occasions, she consumes them in moderate quantity. Nuts and Soya milk are highly nutritious foods, which she includes in her diet for better results. Drinks enough water as it helps to flush out harmful impurities out of the body. She prefers to eat every 3 hours to stay energetic throughout the day. Kareena prefers a combination of cardio, yoga exercise and dance in her workout session. She dedicates a minimum of 1 to 2 hours everyday for fitness. She also firmly believes in Yoga as it is effective in synergizing the body and mind. Payal Gidwani Tiwari, a renowned celebrity yoga trainer helps Bebo in her yoga sessions. Cardio Exercises: Running, Biking, Swimming; Whenever she is shooting outdoors, Bebo prefers long walks. Few popular Asanas include Kapalbhati, Virabhadrasana, Parvatasana, Bhujangasana and Naukasana. While the Kapalbhati helps in getting relieved from stress, in order to strengthen the back, abs and legs, she does Bhujangasana, Naukasana, Virabhadrasana and Parvatasana respectively. Instead of following crash diets for a few days and getting back to bad eating habits, it is advised to follow a healthy eating lifestyle throughout the life for best and permanent results. Yoga is very beneficial is bringing flexibility to our body and it also helps in burning calories, thereby helping you lose weight without hitting the gym. Additionally, your mind and body will become active throughout the day. Stay away from 3 white poisons as much as you can – white rice, sugar and salt. Drink at least 3-4 liters of water every day. This will not only solve hunger pangs but also flushes out impurities from your body. Protein is said to make you feel full for longer hours. So, include more protein in your diet for better weight loss results. A healthy ratio of nutrients would be to get 50% protein, 30% carbs and 20% fat. 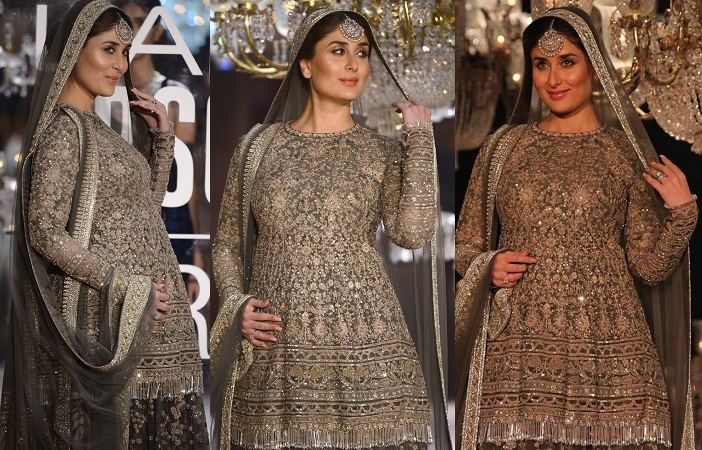 Even after her marriage with Saif Ali Khan, Kareena Kapoor Khan has maintained a slim figure. Surprisingly, she recently stunned everyone after she appeared with a baby bump but with no extra fat storage in the body. This itself shows how dedicated she was with her fitness. Below are a few photos of Kareena Kapoor Khan before and after her weight loss transformation and also during her pregnancy period. Well, what do you say about Kareena Kapoor weight loss diet and exercise? Isn’t her transformation inspiring? Please do share your views and opinions in the below comments section. Previous Post:How to Make Skim Milk from Raw Milk at Home?